(S0208) The asylum is never a fun place because it seems as though everyone in it—employee and patient alike—is disturbed. That is why when a show like American Horror Story: Asylum decides to give its nasty characters karmic justice, it's more than satisfying. This Christmas tale not only provides hope for our cast, but also seems to show the series is gaining momentum despite its interesting assortment of plot devices. Sister Mary Eunice (Lily Rabe) wants Sister Jude (Jessica Lange) away from the asylum so that Satan can fulfill his plan. Dr. Arthur Arden (James Cromwell) now fears Sister Mary Eunice and Lana Winters (Sarah Paulson) finally gains control over Dr. Oliver Thredson (Zachary Quinto.) Oh, did I forget to mention that Sister Jude receives the spanking at the hands of Santa? That happens too. It's as weird as it sounds. One thing I've noted about Asylum is that it pulls random characters out of nowhere to progress its plot. This week, they bring in a sadist Santa with a vendetta against Sister Jude. Last week, they brought in an angel of death. These one-time characters serve no other purpose but to motivate the protagonists because, more often than not, many of the main characters are in impossible situations. For example, it was the angel of death that invigorated Lana to escape Dr. Thredson's apartment. We also have another reappearance of the aliens, which seem to do the job of keeping characters alive rather than dead. I must commend Asylum for not over using the aliens, as it is a plot device that can become a crutch. I can't help but receive an X-Files vibe from this plot device and it's not surprising considering James Wong, a previous X-Files writer, is on the creative staff for Asylum. Even with all of the random characters and capricious abduction scenes, the writers craft some satisfying showdowns in this Christmas themed chapter. After receiving a spanking from her sadistic Santa, Sister Jude manages to defeat him by using a knife while Kit (Evan Peters) and Lana capture Dr. Thredson. Dr. Arden is coming to respect and fear the Satan possessed Sister Mary Eunice which now makes him even more interesting than he was originally. His character is now experiencing the Lovecraftian nightmare: God exists and hates you. The story is now swirling into an abyss of despair and we are all left wondering how alien abductions, Satan, the Bloody Face murders, and Nazi experiments all tie together. Knowing Ryan Murphy and his colleagues, there won't be any story lines crossing over into each other anytime soon, but I do hope that they all team up and take down the real bad guys here, even if Sister Jude is a little bit too preachy for her own good. Lumpy Space Princess seduces Finn with her lumps. Posted on Tuesday, June 19, 2012, by Dean "The Machine" Childers. great to see you back in action, Machine ! I dropped out on AHS after watching most of the first season. As cool and inventive and creepy as it was at times, I got a little bit bored. 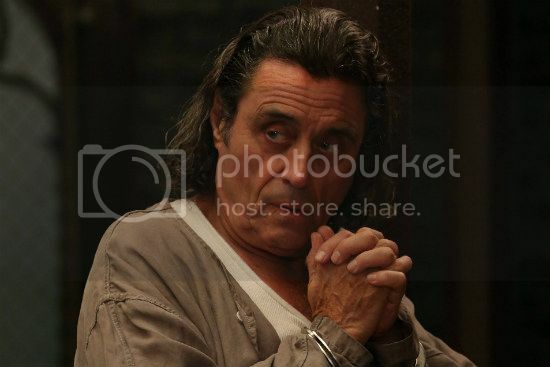 But Ian McShane appearing alone makes me want to catch up on S2. This episode with Ian McShane as a deranged Santa was just as disturbing as last season's episode with the school shooting. I love the demon nun though, she plays that part so well! Season two isn't as good as one, but it is still entertaining.